Interested in renting a hall for a reasonable price! 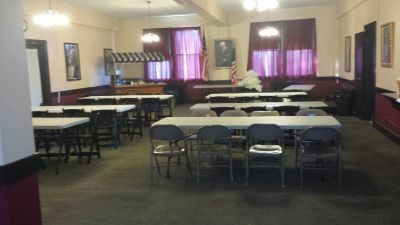 Look no further, the Meriden Masonic Temple has two floors for many different venues. Our Small Hall has the capacity for 30 individuals. For this room we suggest small birthdays, baby showers, dinners, bridal showers and anything else that you can imagine. What Comes with this hall? Up to 8 tables and chairs for the event. Our Large Hall has the capacity for about 200 indivduals. For this hall we suggest large dinners, weddings and or receptions, concerts, and any of the theatrical arts. Up to 20 tables and chairs for the event. Available time to set up and to take down. Please print contract and bring to first meeting.